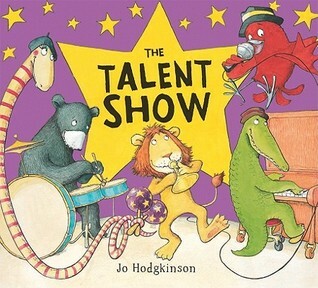 Lion, Bear, Snake, and Croc have a rocking band for the talent show, but not a one of them can sing. The send out advertisements for a singer, but no one auditioning fit the bill just right. The little red bird they have laughed at twice because of his size finally tricks them into letting him audition by standing on stilts and wearing dark glasses and a hat. But in the middle of the audition his coat slips off and the band realizes that they misjudged him. The little red bird joins the band and they win the talent show and the big prize. 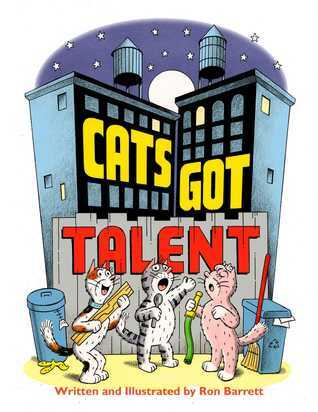 Hal, Dora, and Geneva were three cats who met one night in an alley going through a garbage can for dinner. They decided to sing and become famous so they could get everything they wanted, food, clothes, and fancy gifts. They practiced and practiced until opening night. Their howls and yowls woke up the neighborhood. People from every window threw eggs, tomatoes, garbage, shoes, picture frames, and clocks at them. The three cats had everything they’d ever dreamed of and stopped singing immediately. This early chapter book is more appropriate for independent readers. The pictures are very similar to graphic novels and will appeal to the older picture book reader. Hot Dog is a labrador/dachshund mix with the appearance of a hot dog and a taste for them too. When Ella wants to join the school talent show with Hot Dog, he tries very hard to please her but ends up making a fool of himself and her. But in the end, when all the other dogs lost control of themselves over a loose hot dog, they fell all over the judge licking her face. 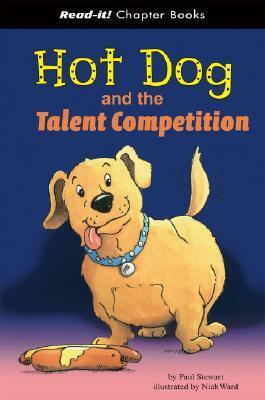 She eliminated all of the dogs except hot dog and he won the prize. Ella won the $10 prize money and they both had a hot dog treat before going home.